The Quinnipiac are the Indigenous inhabitants along the Atlantic shoreline of what is now New Haven, Connecticut to Madison on the east and as far north as Meriden. During the early 17th Century, they were trading partners with the Dutch, who called them the Quiropy. Decades later, the prominent leaders were Montowese, Momaugin, and Shaumpishuh. 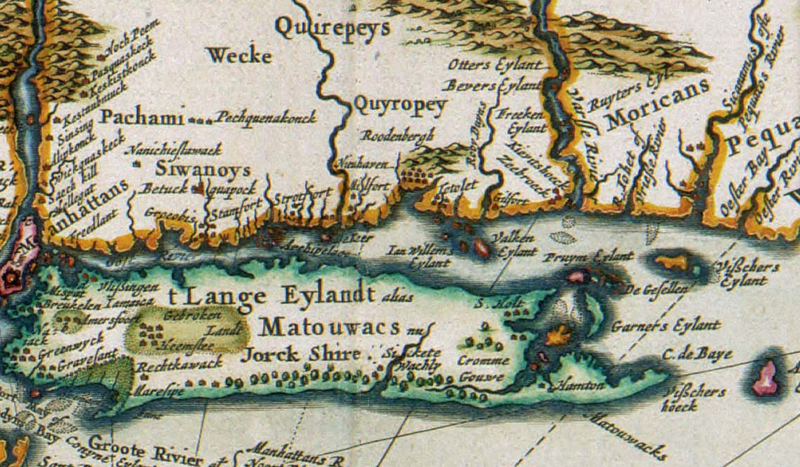 With the advent of English colonization after the Pequot War, the community removed to what may be New England's first Native American reservations in Mioonkhtuk (East Haven), Totoket (Branford), Menunkatuck (Guilford), and part of Quinnipiac proper (North Haven). After much land loss in the 18th Century, some community members removed to Waterbury or merged with either the Paugussett or the Tunxis in Farmington before migrating westward in the Brothertown movement. Other Quinnipiac remained in Connecticut, living and working in shoreline towns, sometimes selling baskets or other Indian wares. The Quinnipiac are not presently one of Connecticut's recognized tribes, nor do they have government-to-government relations with the federal government. For a more complete history of the tribe, see John Menta, The Quinnipiac: Cultural Conflict in Southern New England (New Haven, CT: Peabody Museum of Natural History, 2005). Dutch map (detail) showing the 17th Century Quinnipiac (as Quyropey) territory: Nicolaas Visscher II (1649-1702), NOVI BELGII NOVAEQUE ANGLIAE NEC NON PARTIS VIRGINIAE TABULA, Koninklijke Bibliotheek, the Dutch National Library. Image courtesy of Wikipedia. We certify that we have no 1 knowledge or remembrance that Hannah Rushick, a squaw, was ever possessed of any property in this town or ever2 resided therein or that she is an inhabitant of Branford. Whereas we, the subscribers, were appointed by the Honorable General Assembly of the Governor and Company of the State of Connecticut at their sessions at Hartford in May A.D. 1777 a committee to make a just and equitable distribution and division of the lands lying said Farmington belonging to the Tunxis Tribe of Indians and in which said tribe have an interest in common, having respect to expenses paid by individuals, which ought to have been defrayed by the tribe at large to each proprietor in said tribe and to make their report, etc. To the Honorable General Assembly of the Colony of Connecticut now sitting at Hartford in said colony.